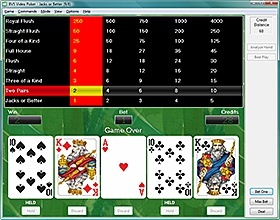 We offer you the largest collection of original solitaire card games and video poker simulator/trainer with 42 different video poker variations. You can download and try any of these products for free. 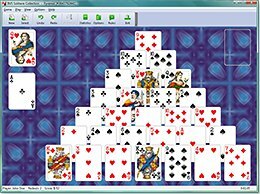 BVS Solitaire Collection 7.9 for Windows XP/2003/Vista/7/8/10 is an award-winning collection of 499 solitaire card games. It includes a lot of original variations you won't find elsewhere. If you're tired of Klondike, check out this unique collection. Even if you've played a lot of solitaire these games will definitely be new to you. You can modify rules of almost any of the included games, thus creating your own solitaire game variation. BVS Video Poker 3.0 for Windows XP/2003/Vista/7/8.x/10 is an enjoyable game that simulates video poker gambling machines. It features the most commonly found machines in casinos: Jacks or Better, Deuces Wild, Joker Poker, and more. BVS Video Poker can also be used as a teaching tool. It trains you to use the best long-term strategies when playing video poker. Each variation of video poker has its own individual winning strategy and taking the time to learn your game means better payoffs. Copyright � 1996-2017 BVS Development Corporation. All rights reserved.